We are both standing at a crossroads. Life decisions. Future directions. Deeply profound. Heavy meaning. Yadda yadda. We are standing at THE crossroads. The legendary crossroads in Clarksdale, Mississippi where Robert Johnson famously sold his soul to the devil in exchange for mastery of the blues guitar. THAT crossroads. I guess it’s only fitting. 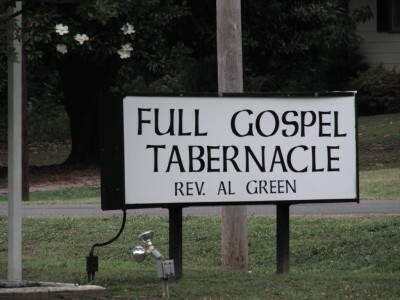 We started this morning at Al Green’s All Gospel Tabernacle in Memphis, where Bishop Green himself saved our souls with a two hour, all-singing, all-dancing, tongues-speaking, Lord-praising, barn-storming hallelujah of a Sunday service. So I suppose it’s appropriate that we should be drinking beer and making Faustian pacts at sundown. We don’t have any photographs of the inside of Al’s church – we didn’t feel it appropriate. That said, how are you supposed to behave when VERY large VERY elderly ladies are moshing in the pews to the power of a funk Gospel breakdown? Bowed heads? Applause? CPR? It was like nothing either of us had ever seen. Bishop Green was deeply, deeply charismatic, if … erm … slightly hard to follow in the logical thread of his preaching. Just go with it – Church of England this ain’t. 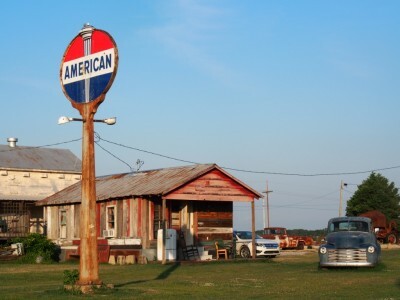 Clarksdale Mississippi, on the other hand, is home to the Shack Up Inn (thanks for the intro LouAnne!) – a motley collection of renovated shotgun shacks down by the railroad tracks (der DER da da DUM!) surrounding a bar / impromptu performance space. Our shack for the night used to belong to Robert Clay, another long suffering blues man whose spirit suffuses the place. If Lucy leaves me, and if my dog up and dies in the night, I will know who to blame. The Shack Up Inn - how exactly does one "dust a broom" anyway? On today’s journey from the deeply holy to the merely spiritual, we paused for a few hours at the National Civil Rights Museum. Built in and around the motel in Memphis where Martin Luther King was assassinated, this was yet more deeply powerful stuff. Seeing the iconic images of race hatred and determined struggle set in their proper historical context (it was unbelievably recent) was a two-wide-eye-opener for a couple of measured Brits, and a reminder that modern day New York and 20th Century America are two very different places. This entry was posted in Inspiration, Soundtrack of the day by James. Bookmark the permalink. hope you had some grits by this point! Hope to make it there one day! Thanks for keeping us updated with your travels, J and L!